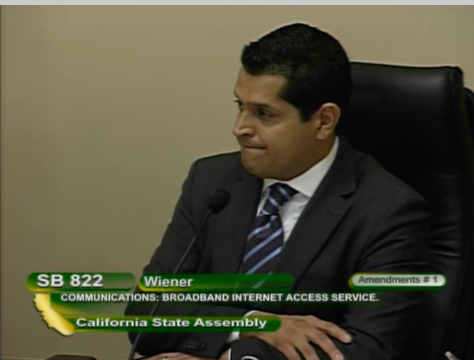 In an unprecedented move, the California Assembly’s Committee on Communications and Conveyance just bucked standard procedure and railroaded through a vote to amend net neutrality bill SB 822 by adding gaping loopholes asked for by ISPs like Comcast and AT&T, who are a top donor to the committee Chairman, Miguel Santiago. The forced vote on the Amendments passed 8 - 2, with 4 Democrats joining 4 Republicans to eviscerate SB 822, making them the first Democrats to actively help the Trump administration dismantle net neutrality. * Allow ISPs to charge websites and small businesses “access fees” just to reach their customers, and block any website or service that doesn’t pay the fee. * Allows ISPs to Zero-rate their own content, ie AT&T can incentivize you to watch CNN, which they now own, or Comcast can make it free for you to go to NBC’s website while making you use your data to get your news elsewhere. * Allows ISPs to charge services fees in exchange for zero-rating them, giving large corporations a huge unfair advantage over startups and small businesses.